No grill? No problem! Here’s how to make a juicy panfried burger at home. I don’t have a grill. At least not one that’s easily used when I feel like making a burger or steak or whatever. No, all I have is a little, tiny, kettle-style grill that we used once. Between the flames and the fact that the charcoal burnt out before we finished cooking, I haven’t felt drawn to use it again since. This fact has become a little irksome. I love grilling. Back in Connecticut, I grilled most nights all summer long — steak, chicken, burgers, sausage, fish and other seafood; it all took a spin in our meal rotations as grilled wonderfulness. Of course, when I moved in my landlord said grills were prohibited (they’ve since allowed at least one new resident to have one … so maybe that changed?). So I’ve been waiting … waiting for that time when we find just the right new digs and move. Unfortunately that hasn’t happened yet, and when I took a tour of the gigantic dream house in my price range, I was 100 percent overwhelmed by its size. Back to the drawing board. In the meantime, when the craving strikes for a good burger, I know how to make them indoors — this method for making panfried burgers yields a juicy, flavorful burger that’s satisfying and delightful. Seasoned with salt, pepper and garlic powder, it brings out the natural flavors of the beef. And then it’s cooked to however you like it done. Topped with cheddar, bacon, lettuce, tomato and onions, it’s just a classic, good burger. Of course, there’s a trick to making these. The burger patties need to be thin — no more than 1/2-inch thick, actually. That allows them to both remain big enough to fill out a bun and also to cook easily without a lot of fuss or waiting. Divide the ground beef into four equal-sized pieces. Season liberally on each side with salt, pepper and garlic powder. Using your hands and working with one piece at a time, form a thick, round burger patty. Then, press to flatten into a large, round patty -- your patty should be no more than 1/2-inch thick and should be larger than the buns you've purchased. The burger will shrink as it cooks. Heat a large nonstick skillet over medium-high heat. 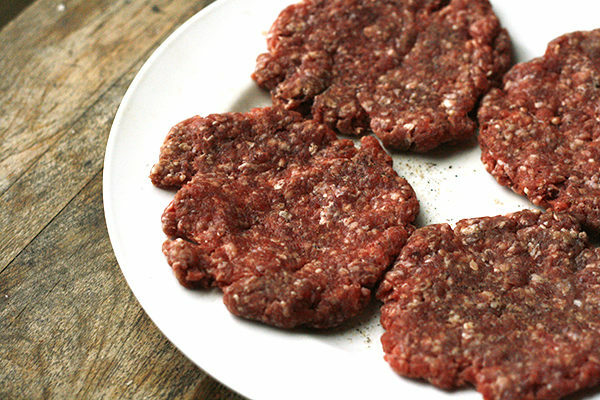 Add the burgers, cooking in batches if necessary, and cook to desired doneness, flipping once. I usually cook mine for about 4-5 minutes per side for a warm, red center. Cover each with a slice of cheddar and allow to melt. Remove the burgers to a plate. Meanwhile, while the burger is cooking, cook the bacon in a large skillet over medium heat until browned all over. Remove to a paper towel-lined plate. Slice open the pretzel buns or buns of your choice. Brush the cut side with bacon grease, and toast in the nonstick skillet you cooked the burgers in for 3-4 minutes, until warmed and lightly browned. Finally, assemble your burgers. 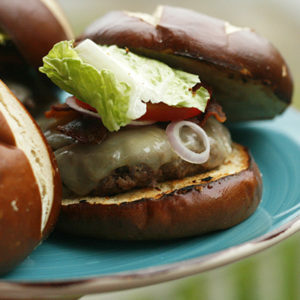 Place one cheeseburger patty on each of the bottoms of the pretzel rolls. 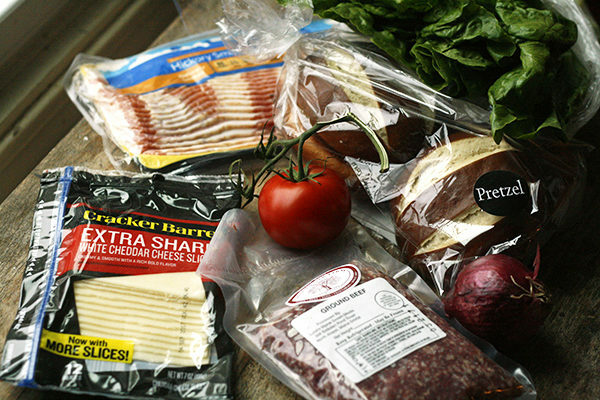 Top with bacon, tomato, lettuce and red onion. Add condiments, as desired. 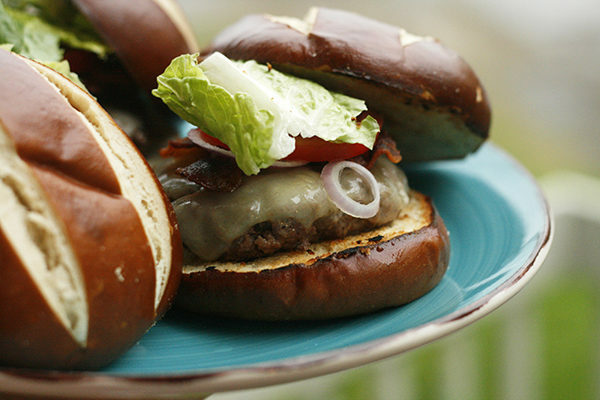 Oh, and one more thing … I used pretzel buns for these burgers. But homemade focaccia hamburger buns would work too. Mmm. And just a side note: this post isn’t sponsored at all and I am not affiliated with any of these brands … I just thought burger month was a fun thing to join in on. 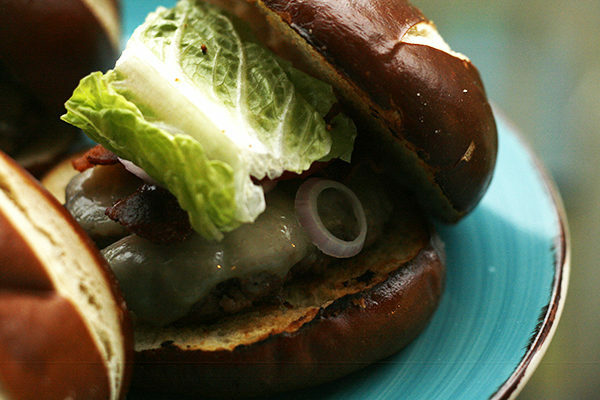 Yes lots of cheddar please and loving those pretzel buns! I got a small portable grill for my balcony last year after the old dinosaur died. And I got the special tube to connect a big tank to it. You could picnic grill in parks too when your NEED IT lol. I didn’t register for a grill pan when I got married, but someone got one for me anyway, and when I was living in an apartment with not grill, it became my favorite wedding present of all I had received.